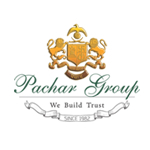 Pachar Group was established in 1982 at Rajkot, Gujarat. We started at a very small scale with a project for six houses.We were confident about our work and expanded it in Rajkot, Ahmedabad and Baroda. In 1987, we got struck because of water scarcity in Rajkot. One had to show a ration-card to get water according to number of people in the family. We had no other choice but to stop construction there. Till 1998, there were only 5 to 10 entities who were in this industry, the reason being the strict rules of the government and construction policies. In 1998, a little boom came in the industry, which attracted new entries. Our first property was on Hawa Sadak called G.S. Apartment, a multi-storey building. On getting an optimistic response from the consumers, this group undertook many such conceptual buildings including Malviya apartments, Tirthraj apartments, Shubham apartments, Prabhuraj apartments and Mall 21 Shopping Complex. Our current projects are running in Udaipur, Jodhpur, Jaipur and Kota. In Jodhpur, we have a complex and multiplex. In Udaipur, we are planning to build villas, golf course and hotel. In Kota, we are planning residential apartments. One of the projects design in Kota is based on the city of Venice, its concept being that it will be floating on water. The base is of a lotus, and the property will be spread around that. We are building this close to a canal.